The Pacific Crest Trail Association’s annual awards serve as a means to recognize members, volunteers, partners, and supporters for extraordinary achievement. Every year we ask our partners, members and volunteers to nominate people in the community for their exceptional contributions. Click the award categories below to read more about each award and see a history of winners. The Lifetime Achievement Award honors extraordinary commitment and service to the PCT over many years. This award is not presented every year. The Alice Krueper Award plaque. 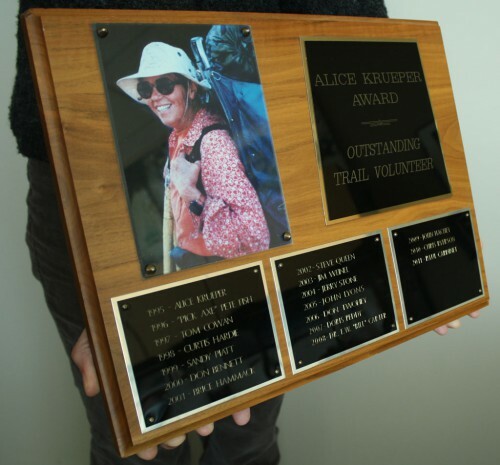 The Alice Krueper Award is the PCTA’s top honor for outstanding trail maintenance volunteers. It is given to the person identified by the Trail Operations Committee members (including regional coordinators and the Trail Operations Director) as having done the most for trail maintenance during the year. Often, the award recipient has previously received a regional Trail Maintainer of the Year Award. The award represents a spirit of dedication as was exemplified by Alice Krueper. The award recipient’s contributions are deemed outstanding. The award recipient is also seen as an excellent role model or example for other volunteers. Generally, this person is also well known and respected among the government agency employees who work in his or her area. This award recognizes the packing services provided by a volunteer packer whose passion and ongoing commitment assists with maintenance of the PCT in Wilderness Areas and remote locations. The Partnership Award is given to a partner that has provided exceptional assistance to the PCTA and contributed to our mission. Often, the PCTA has worked extensively over the past year with this organization. This award is given to an individual in each region who has distinguished him/herself in hours and service to trail maintenance during the past year. Please note the region categories for Regional Trail Maintainer of the Year awards have shifted to align with the PCTA’s Regional Representative boundaries. A listing of previous winners in the old categories is included for reference.